No Canadian farmer purposely manages a crop to perform just under par. But farmers, whose ideal summer evening may include at least nine well-manicured fairways, are unknowing participants in an agronomic work of science that’s largely centred on growing a crop marginally shy of peak health. While nature makes sure farmers and golf turf managers can’t achieve perfection, the push to grow plant communities that generate a great golfing experience are uniquely taxing. 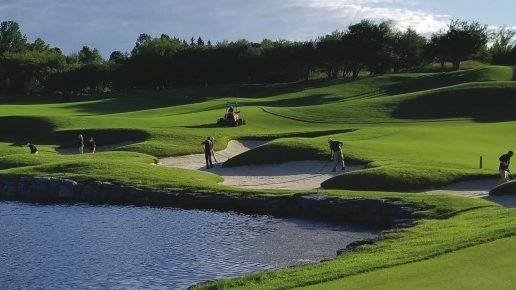 “We have to work at finding a healthy medium because even though you want a course that looks great, a really healthy and dense turf is difficult to play,” explains Rob Wright, golf course superintendent at Devil’s Pulpit and Devil’s Paintbrush, two golf courses about 45 minutes northwest of Toronto. Besides contributing to “worm burners” and “flubs” (golf speak for a poorly hit shot), peak turf provides ideal conditions for the spread of grass-killing pathogens that are nourished by heavy thatch, says Wright. “The depth of the science behind turf management is incredible — it’s really what makes the job fascinating,” says James Beebe, golf course superintendent at Priddis Greens Golf and Country Club, a 20-kilometre drive from Calgary. Nestled in the foothills of the Rocky Mountains, Priddis Greens is comprised of two 18- hole courses carved from a natural forest of towering spruce. At 1,120 m (4,000 ft.) above sea level, long winters with high snow and moisture are part of an alpine-type growing zone that’s ill disposed to growing picturesque fairways and greens. “The shade in the winter and spring isn’t conducive to melting the snow, and chinook winds generate a freeze and thaw pattern that can really hurt the turf,” says Beebe. Back in Ontario, Wright’s job is complicated by the fact he manages courses that deliver completely different golf experiences. Devil’s Pulpit features a parkland-style course with treed areas and lush fairways; a kind of “Augusta north” environment, while the design of the links-style course at Paintbrush resonates with the rougher courses of Scotland. While the greens at both courses are bent grass, the fairways at Paintbrush are seeded to a drought-tolerant low fescue. Rough bluegrass dominates at the Pulpit, where tall fescue is used in the shadier areas near the trees. Fungal diseases in general, and snow mould in particular, top the list of turf-killing infections Beebe and Wright train their staff to identify and control. Morning staff meetings at Wright’s Ontario courses include reminders about the importance of disease scouting and the need for diligent thatch management. At Priddis Greens, concerns about what happens during the winter means “we’re thinking about putting the golf course to bed by early summer,” says Beebe. “We don’t want to overstimulate growth as that will leave organic matter where spores overwinter,” he explains. Beebe’s staff is also on the lookout for the annual bluegrass that creeps into their bent grass greens. A nasty competitor during the growing season and highly susceptible to winter kill, annual bluegrass creates dead spots in the greens. While insect pests aren’t always an issue, Wright says they watch for and will control grass-root-eating grubs. At Priddis, where summer insect damage is abated by cool temperatures, Beebe is wary of the damage done by voles, a root-and-stem eating rodent. Good access to the latest science is essential to his job, says Wright. He contacts an agronomist several times a year and uses soil test data to guide nutrient management. When in doubt about which pathogen he’s treating, Wright sends tissue cultures to a lab at the University of Guelph, his turf management alma mater. Golf’s luxurious caché disguises a business of tight margins, adds Beebe, who often invites Bayer experts to speak at in-house education sessions and seeks advice from Bayer’s PhD-level turf grass pathologist. “We’re like farmers in that when we need to apply products — the conditions are never perfect,” he says. “It’s really a business decision. I want to make sure we are getting the best bang for our buck.” Beebe also appreciates Bayer’s support with questions about environmental stewardship.